"I'd like to thank God..."
Radio Awards are funny things. I say that, because I’ve had perspective from being both a judge and potential recipient of an award last week. 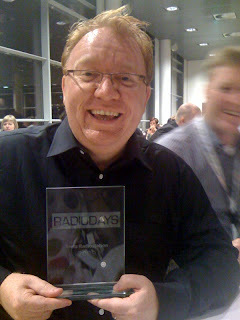 I’m happy to say that at the Danish Radio Awards 2009, one of the biggies... “Station of the Year”, went to Radio 100FM (where I am Consultant Programme Director). So of course, let me first say that this award recognises the efforts that everyone made throughout the year!! I’m pleased, not only because I believe the station did some innovative and engaging programming in 2009 and the team worked exceptionally hard, but because it beat the ‘might’ of the public service station P3, which is a little bit like BBC Radio 1... only quite a bit broader in its output. I was reminded of the nice pot of money that some public service broadcasters have given to them in some countries whilst I was speaking at the rather excellent Radiodays conference in Copenhagen at the weekend. The new shiny ‘DR’ headquarters was the venue, and boy... have spent a bit of money on their building!! It was so over budget when they finished it, that the DG lost their job! I think one of the toilet blocks is bigger than the whole Radio 100FM office space! But it’s not what it looks like... it what’s you do with it, right? Meanwhile, last week I judged the Radio Academy’s Promotions and Marketing Awards in the UK. There were some great entries in my category and I look forward to meeting everyone on the night of 22nd October. If you came along to either Radiodays session in Stockholm or Copenhagen... thanks for coming. Standing room only in both venues. And if you want the handout from the session, just get in touch. I was discussing the rather small topic of ‘convergence of technologies’ with a client this week, and we were talking about how ‘audio entertainment’, including radio, may be consumed in future. There have already been several good posts about the timely launch of the new ‘Pure Sensia’ radio yesterday. It feels to me, that this is a real step forward and places traditional radio at the centre of audio entertainment, which includes downloaded music and personal music databases, internet radio, DAB and more traditional FM services. Combine this with a great user friendly touch screen with possibilities for great visualisation, and an intuitive interface... and you know you’re looking at a big step forward in ‘radio’ hardware. It make the ‘iPod with radio’ look a little passé really doesn’t it? However, the point of radio needing to be included in a 'Digital Future' is something that more and more stations are cottoning on to across the world. We all know that different markets are at different stages of adoption of new technologies... but it really is only a matter of time before it comes to your country if it isn't there already. There is a march of inevitability about it, and ensuring stations are prepared to take advantage of the possibilities and monetise them successfully is something I’ll be focusing a lot of my energies on in 2010. Here’s a great ‘short’ that is very popular at the moment. It puts into perspective the theme of a changing media landscape. If you were unsure about the necessity to adopt and integrate new technologies into your radio business, you won’t be after watching this! FM Radio is Cool - It's Official! So... Apple have finally realised that people do actually like listening to the radio! I'm sure we could have told them that... right? There’s no doubt that Chris’ show will appeal to a younger demo than Terry’s. Just as there is more pressure on the “chilling” BBC to justify chasing younger audiences and generally being successful to excess (and to the detriment of commercial rivals) , they seem to stick two fingers up at the critics and announce a move that undeniably illustrates the point. Let’s not forget that in the last decade, Radio 2’s reach among 15-34 year olds has risen by 62%! Certainly the show will turn off a section of the audience (mainly older Daily Mail readers!) who will still have the perception of Chris as a drunken buffoon who hangs out with Gazza all day and night. The truth lies a long way away from this, but Chris’s ‘youthful exuberance’ is an image he will retain for many years to come. I believe the show will attract listeners from commercial radio... and probably more than it drives away from its existing base. Potential losers could be Absolute Radio, who despite having a very solid and listenable show with Christian O' Connell, may find that the offer of a big personality with a strong breakfast show track record, combined with a broader mix of music genres is a very tempting proposition for listeners. The somewhat ‘disenfranchised’ older listeners to the heritage ILR stations, (like Key 103 and Radio City) and newer regional offerings (like Real Radio) may also find that Radio 2 starts to pull at those all important 40+ demos. After what will inevitably be a backlash from ‘middle-England’ / “disgusted from Tunbridge Wells” and a general outrage at the appointment of Chris to the role, this will die down (as it did shortly after Chris took over Drivetime) and people will get on with judging the show by what comes out of the speaker in the new year. The differences in style between the current Breakfast Show and the Drivetime show on Radio 2 are vast. So the big question is... Will Chris adapt his style to the new time-slot to smooth the transition, or will he re-define the style of the ‘sound of breakfast’ on Radio 2? My view is he will do the latter, and shake up the show. Out go the ‘TOG’s’, and in will come a more bouncy, jaunty style of presentation complete with trademark ‘feelgood’ music beds and ensemble of characters. It’s a great formula that Chris has used repeatedly well throughout his radio career, and I don’t expect him to change now. Although Chris won’t go out of his way to alienate the loyal listeners to Wogan, I’m certain he won’t shy away from making the show his own within a pretty short space of time. It won’t take long before questions are no doubt asked in the House of Commons as to “how much of licence fee payers money is being used to pay for the services of Mr Evans?” Will he be paid more than commercial radio could currently muster for a big breakfast show? Do BBC salaries distort the market? Well – I’m certain that if Mr Park and Co at Global really wanted a networked breakfast show and they felt Chris was the man for it, they would be able to find the money somewhere! (Mind you – can’t imagine Chris appearing on Heart somehow!) The cost of talent is a whole subject in itself, so I’ll save that one for another posting... OK? I smiled a wry smile at the timing of the announcement this morning. It is no accident that Wogan chose to announce this on the very day that Chris Moyles becomes the longest serving Radio 1 Breakfast DJ in its history. Behind the smiles, the rivalry runs deep and there is a certain calculated timing in all this I feel! I’d love to have heard the phone calls between the Radio 1 and Radio 2 press offices today! I’ve always been an admirer of Chris and his sheer devotion to radio as a medium. He consistently delivered some great radio shows on whatever station he’s been on.... OK... there were a few dodgy months at Virgin where the show (and Chris) “lost it” for a bit, but hey... haven’t we all had the occasional wobble?! He’s both a dream and a nightmare to work with, and certainly proves the point that ‘the best talent is the hardest to work with’. But he reminds me why I love working in radio. In a period where traditional radio is coming under pressure from all sorts of digital offerings, (and providing you can set aside the politics of it all), it’s great news to have a real star like Chris heading up a flagship programme like the Radio 2 Breakfast Show. I for one, will be tuned in. "God kväll Stockholm!" 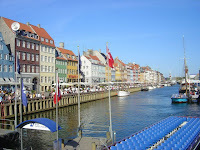 and "Det er dejligt at være tilbage i København!" September.... the kids are back at school, the telly gets good again, and there’s a glut of great radio conferences to look forward to. RADIODAYS takes places every year in one of the world's most lovliest areas, Scandinavia, with Denmark, Sweden and Norway all collaborating to bring the best possible international line-up to appear in each country. I’m pleased to say I’ll be speaking at both ‘Radiodagen’ in Stockholm on 23rd September and the sister conference ‘RADIODAYS’ in Copenhagen on 26th September. 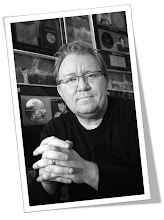 The subject – “Morning Shows – the Secrets To Success” As we all know, Morning Shows are the backbone of music radio stations across the world. Having a great morning show is essential for success in any marketplace. The session will explore what the crucial ingredients are, and whether you can add these together to formulate the recipe for a great morning show. But I’m not doing it on my own… oh no Sir! I’ll be joined by the wonderful Gareth Roberts. I worked with Gareth when he was the executive producer of The Johnny Vaughan Show on Capital FM. Gareth started his radio career as a presenter and news reader before moving to Capital FM, London where he became Head of News. He then moved into programming, producing various big shows before becoming PD at 106 Century FM in the East Midlands. He returned to London in 2004 to become the launch editor and then executive producer on The Johnny Vaughan Breakfast Show on Capital FM. Following Chris Tarrant was a very tough job, but after a difficult start the programme went back to what many saw as its rightful place as "London's Number 1!". After five years of early starts Gareth has changed sides and is now Assistant Editor at BBC London 94.9, overseeing the programming and news output on the BBC's station for London, looking after a highly talented and varied schedule of presenters. He’s a great guy and has a lot of good stuff to say, so I’m delighted we’re going to be working together again (albeit for 2 days only!!) at these forthcoming conferences. We’ll be sharing our thoughts on areas such as character development, benchmarks, music content and features, comedy writers, zoo formats and stunts, as well as evaluating their importance in the overall recipe. Morning Show hosts, producers and Programme Directors should get plenty of fresh ideas to take away to try at their own radio station and hopefully be closer to finding those elusive ‘Morning Show Secrets to Success”! If you’re attending the conferences in either Stockholm or Copenhagen, do stop by and say ‘hej’!